Most of my parts came from Radio Shack here's a list of the parts I Bought. Two electric motors there 1.5 volts thru 3 volts they costed about $1.45 each. 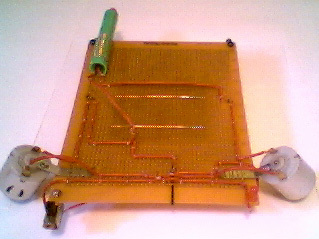 A pc board which I used for the body it costed $5.95. Momentary switchs which costed $2.45. A AA battery holder which costed $1.95. A pack of spst switches which costed $2. A blinking led which I used for the on indicating light it costed $1.45. Every thing else came from the robot junk heap.